Row your boat back to the Despicable Me franchise. I love the Minions. They made the perfect Despicable Me even loonier, and they were the only tolerable thing about the execrable Despicable Me 2. I seem to recall thinking after DP1 that they totally deserved their own movie. But I was wrong. Or at least the movie they've now gotten is not the movie they deserve. Turns out, the Minions are better off without a backstory. Their mystery was part of their charm. Oh, this is fine for little kids. They'll laugh at the slapstick antics of the small yellow blobs and probably have a fine time. But I am not a little kid, and I do not write for little kids. Minions opens with a grand history of the race, starting with their evolution from tiny one-yellow-celled creatures floating in the primordial seas through the form we see them in now. So now we're forced to consider how the Minions evolved when they're all apparently male. At least, they all seem to have male names; the narrator of the history lesson (Geoffrey Rush) rattles off a long list of Minion names — all male — for some reason that makes no sense at all unless it's to reassure us that, yes, all Minions are male. And yet they also have sexual attraction: we witness one Minion hitting on a yellow fire hydrant. So the Minions must all be gay. Not that there's anything wrong with that (or with being hydrant-oriented), but that tends to hinder reproduction without technological assistance. And then there's the Minions' cultural history, as a race driven to find the biggest, baddest villains to serve and worship until accidentally killing them with their bumbling overenthusiasm. First it was T. rex, then it was the Egyptian pharaohs, and so on, right on up until Napoleon... at which point the Minions became depressed as a culture and retreated to the Arctic. What, no Hitler for the Minions to worship and serve and kill? I know, I know: This is a kids' movie, you can't bring Hitler into it! I'm not saying it should have, I'm just saying that getting this specific about the Minions' backstory makes it uncomfortably weird for those of us over the age of 6. When the Minions emerge from their depression and decide to go in search of a new Big Boss, it's 1968 and apparently Richard Nixon isn't good enough for them. So Minion scouts Kevin, Bob and Stuart (all voiced by director Pierre Coffin) settled on the world's first female supervillain, Scarlet Overkill (the voice of Sandra Bullock). 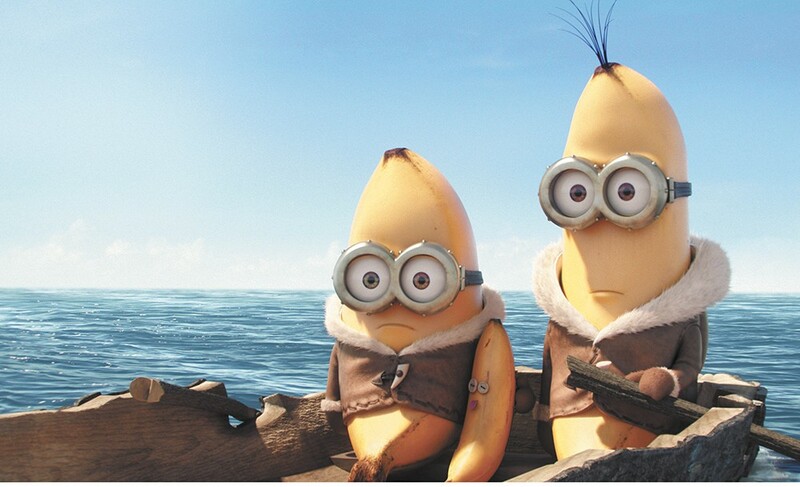 Minions and Minions 3D are not showing in any theaters in the area.